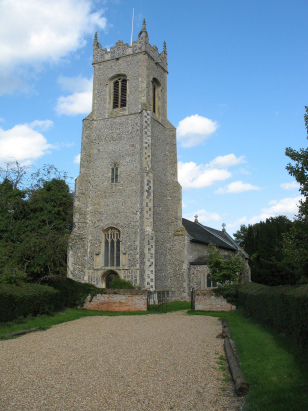 The parish of Alburgh lies in southern Norfolk not too far from the River Waveney, the border with neighbouring Suffolk. Alburgh sits, in lanes, just a couple of miles north of the A143 road which connects the Suffolk market town of Bungay with Diss. The village, sitting on slightly higher ground to the north of the Waveney valley, is rather strung out along a lane leading from the A143 towards Hempnall. Alburgh sits about 3 miles northeast of Harleston and 5 miles west of Bungay. The area is rich arable countryside with large open fields dominating the largely flat landscape, only the removal of hedgerows would distinguish this scene from that pertinent at the time of this transcript. Sadly many of the village facilities no longer exist in Alburgh, a sign of recent changes in provision which would not have been the case in the 19th century. All Saints church sits just to the east of the main area of settlement, on the eastern side of Church Road which runs parallel with the main lane through the village. As Pevsner rightly remarks the tower seems out-of-proportion to the scale of the remainder of the building. 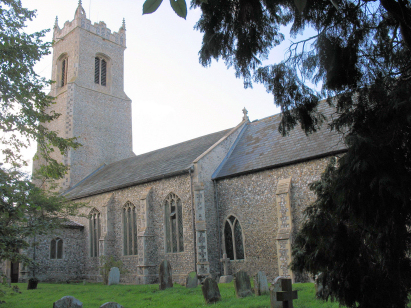 Most of the church is Perpendicular in style, a style used throughout many Norfolk churches. Documentary evidence shows donations for work continuing to the start of the 16th century for buttressing of the tower and the remainder of the church is probably of the 14th and 15th centuries. Like many Norfolk churches All Saints was extensively restored during Victorian times, in this case in 1876, when there was much work on the chancel, the windows and a vestry was added. The church is approached by a fine gravelled driveway from Church Road being set back some 100 yards from the road. The churchyard is rather small and heavily populated by trees which do somewhat restrict the angles available for photography. Two standard 800-entry register books cover the period of this transcript, the second running onwards to completion in the late 20th century. The registers are filmed on Microfiche 8 - 10 in the collection of Norfolk Record Office but are also available online at Familysearch as digitised images of a superior quality to the fiche. The latter were used to prepare this transcript making for a straightforward piece to prepare.